Suri & Katie spotted out in NYC on April 24th 2012. Suri enjoyed all her favorite activities: visiting Dance Studio, shopping at American Girl store and attending "Newsies" Disney Musical on Broadway!!! 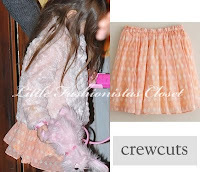 Suri pictured leaving their apartment in NYC on her 6th BirthDay - 18th April 2012.
outfit info: Pink Stripe Dress by Circo for Target (first worn on November 13th 2011) and Silver Ballet Flats by Nordstrom. Happy 6th BirthDay to Suri!!! Happy 6th BirthDay to Dear Suri!!! Suri & Katie arrived by helicopter to NYC on Monday, April 16th 2012. Suri will turn 6!!!! on Wednesday, April 18th!!!! Looks like they have a different celebration planned for this year!!! 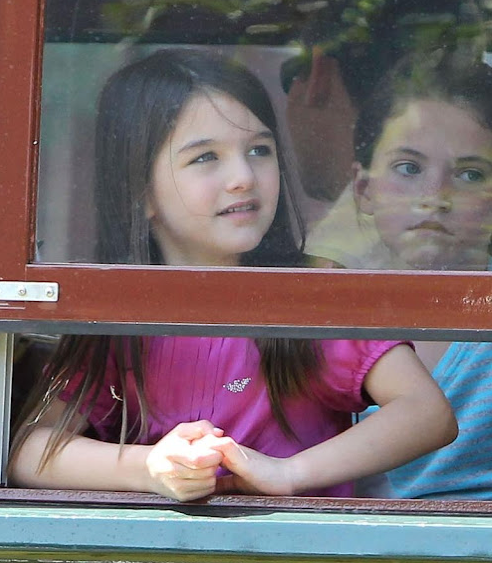 Suri's 3rd and 5th BirthDays, The Cruise Family celebrated together at their estate in LA. Suri was wearing Stripe Cozy Cotton Tullerina Tank in Hyacinth by Crewcuts, (first worn on July 20th 2010) and Basket Print Candytuft Skirt from SS'10 by Crewcuts. outfit info: shoes by nordtsrom. 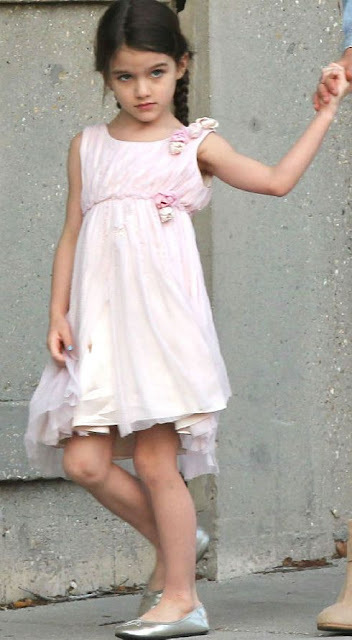 Suri stepped out with Conor, Parents & Grandparents in Baton Rouge, Louisiana on April 6th 2012. Suri enjoyed a train ride to see all local sights. 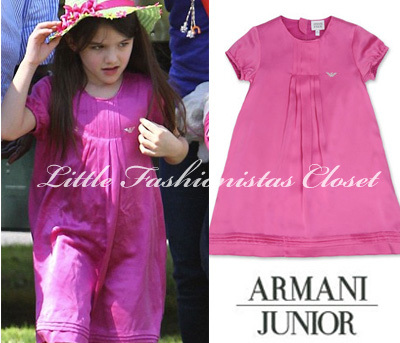 Suri is wearing Pink Silk Dress SS'12 by Armani Junior and Silver Ballet Flats by Nordstrom. 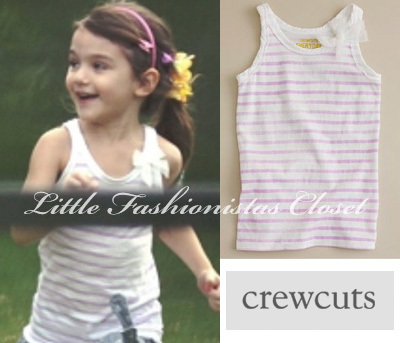 Suri went out shopping with her grandparents in Baton Rouge, LA on Apeil 2nd 2012.
later evening, the extended family headed to dinner. outfit info: dress by crewcuts, shoes by nordstrom. 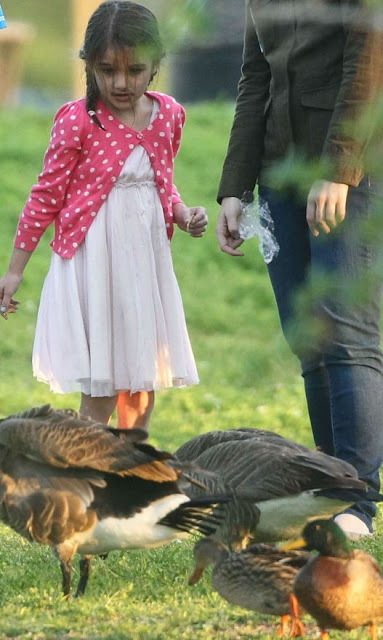 Suri & Katie spent a sunny afternoon at the park in New Orleans, on April 1st 2012. 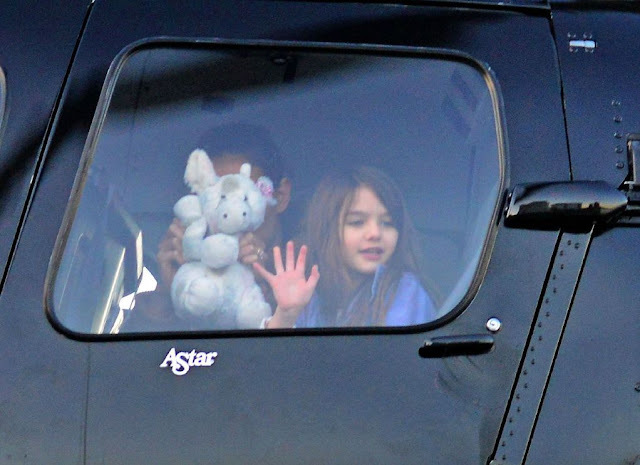 Suri packed her toys in a backpack and left their NYC apartment to take off in a helicopter, on March 27th 2012. 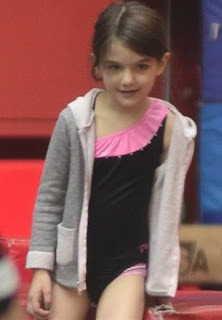 Suri Cruise is a True Style Icon in her bright outfit, while heading to a gymnastics class at Chelsea Piers on March 27th 2012.
at some point, Suri was also wearing her Juicy Couture mittens! outfit info: dress by little marc jacobs, faux fur coat by juicy couture and shoes by nordstrom. 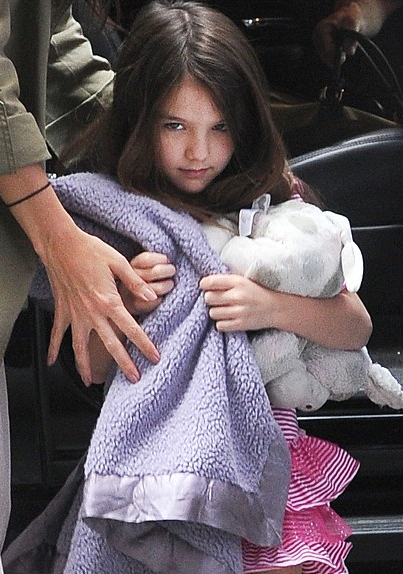 Suri left her NYC apartment holding a box of toys to meet up with Katie, on March 26th 2012. Suri makes a 2nd trip to Make Meaning store for some arts & crafts supplies on March 25th 2012.
and later S&K go out for a lunch date. outfit info: Heritage Rose Dress SS'10 by Monsoon UK, Violet Suede Utility Coat SS'12 by Holmes&Yang and Silver Ballet Flats by Nordstrom. in the afternoon, Suri visited Build-A-Bear Workshop store in NYC on March 23rd 2012. Suri started of her busy day with a gymnastic class at Chelsea Piers, NYC on March 23rd 2012.
outfit info: navy floral dress (no id) and shoes by nordstrom. Suri headed to The New Amsterdam Theater for Marry Poppins - Broadway Disney Musical on March 21st 2012.
later Ladies enjoyed a dinner at Joanne Restaurant. outfit info: dress by gap, cardigan by target, shoes by nordstrom. 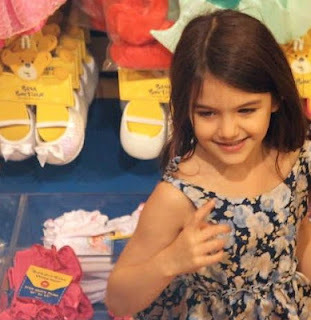 Suri & Katie stopped by a toy store - Make Meaning in NYC on March 20th 2012. 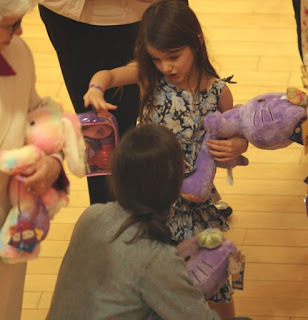 "Right away, Suri ran towards the toys – but this wasn't a shopping trip. Instead of treating her to new trinkets, the trio ended up on the second floor, not in a private room, painting ceramics. later Ladies headed out to dinner at The ABC Kitchen. 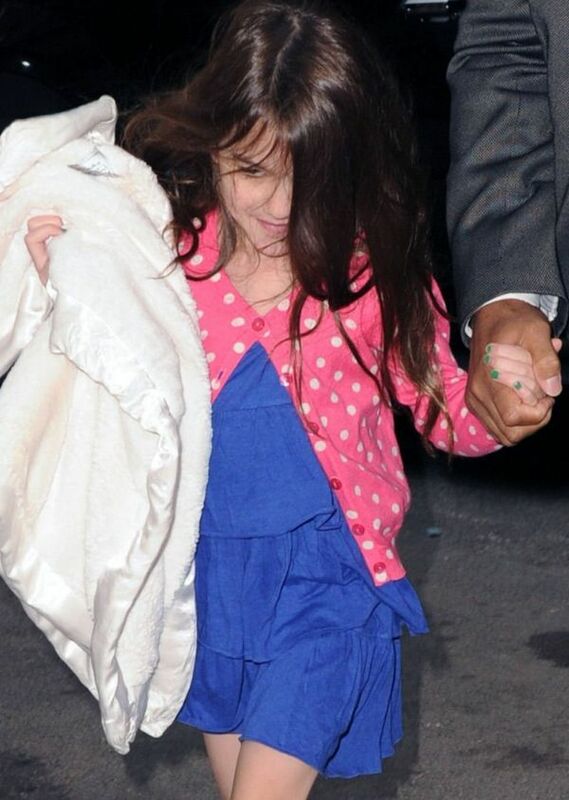 Suri was holding Madeline Tea Set Case. 1st outfit info: Fuchsia Silk Tiered Dress SS'12 by Holmes&Yang. 2nd outfit info: Heart Design PJs by Esme, Violet Suede Utility Coat SS'12 by Holmes&Yang and Silver Ballet Flats by Nordstrom. 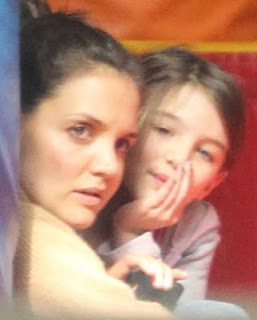 Suri went to a Whole Foods store with Katie & gradmother Katleen, in NYC on March 19th 2012. 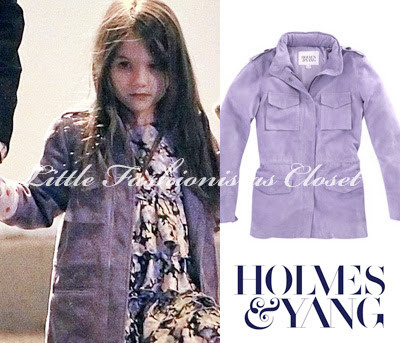 Suri was wearing Violet Suede Utility Jacket SS'12 by Holmes & Yang. outfit info: Navy Floral Dress and Silver Ballet Flats by Nordstrom.